operations in Brazil located inside an Indigenous Territory. 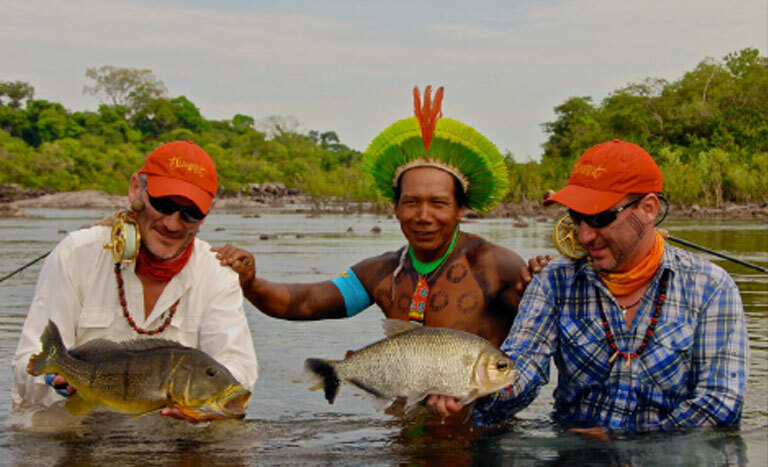 It is this unique and forward-thinking concept mirrors the business plan of Untamed Angling, who previously implemented the formula on their now world-renowned Tsimane Lodge in Bolivia and Marié River in Brazil. Their success and refined strategies have now duplicated and implemented by the Brazilian Government on the vast Kayapó land and Iriri river basin. With the implementation of this concept, it should guarantee not only a exclusive and world-class fishery well into the future, but the protection of a priceless rain forest, and amazing cultural adventure for visitors, as well. 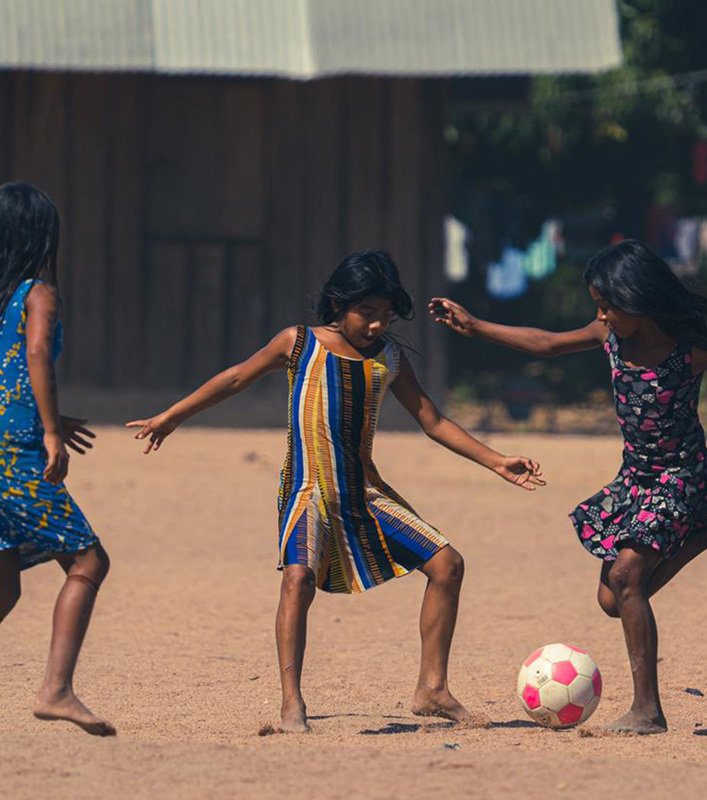 Kendjam project was based as a long-term environmental and social project, which supports the Kayapó Indians of Iriri river in sustainable way to develop new productive alternatives for their life while at the same time, protecting their land and culture and improving they life quality. 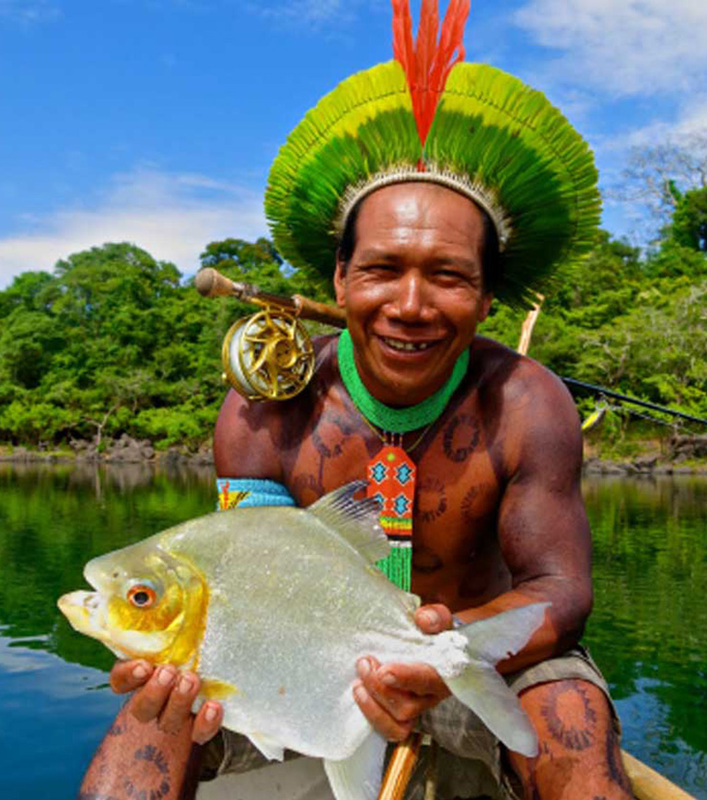 The local association (AFP) and the Kayapós are the managers of this project and participate in all aspects of this world class fishing venue. We cooperate with government fisheries management officials and various other government agencies in developing research programs and collection of biological data to further understand the fishery and ecosystems. The data we secure will be used to ensure that our waters, the surrounding ecosystem and local people will maintain their vitality and be protected for generations. We promote and practice sustainable operations through the use of renewable energy, proper waste treatment, recycling, and minimal environmental impact to reduce our footprint. Unlike other tourism enterprises, our destinations, purposely accommodates small groups of anglers in an effort to reduce environmental and social impact but keeping high value in each package. We work in a unique clear water environment, perhaps the last virgin river for several jungle species in Amazon. Our goal is to provide anglers the very best fishing experience in its class. We respect the magnificent jungle fish and share the same belief as our local partners. Protecting these waters will keep this fishery healthy for generations and will help local communities to move forward in a sustainable activity. We work very closely and cooperatively with government agencies and local native communities in securing and maintaining the proper permits and licenses. This guarantees the exclusive use and control of the Kendjam world-class fishery ensuring a sustainable and non-consumptive use of the resource. Untamed Angling has designed a unique working platform for all its projects: a team formed by a professional and a native guide working together. The pro guide provides specific technical skills and the native guide intensive knowledge of the forest and the fish. The lodge is located in the heart of the reserve and is unique eco buildings with the exclusive service and attention. fly-fishing techniques to catch several new jungle species from Peacock Bass to Payara, Pacu, Wolf fish and many more! Kendjam is a remote and small indigenous community (15 Kayapo families live in Kendjam) right in the middle of most preserved Kayapo land and is located in the epicenter of the Kayapó Indigenous Nation: the Mekragnoti Indigenous Territory, an area of 5 million hectares of pure virgin Amazon forest. Only 700-Indian live in this enormous area, creating one of the most isolated portions of Tropical Jungle on earth. Kendjam is located 550 miles southeast from Manaus and plane will land on the airstrip right in the Kendjam Indian Community. The Iriri River headwaters system inside the Mekragnoti Indigenous Territory (more than 700kms), never fished before by white people. The Iriri River begins its journey inside the jungle in the border of Mato Grosso and Para states, and run into the northeast side of the Brazilian Amazon for more than 1300kms. It’s a tributary of the mystic Xingu River. The dry season is the low crystal clear water season and runs from June to late October in the Iriri River Basin, and the perfect moment for the adventure angler meet the most intense jungle fishing experience. The Mebengokre / Kayapó Indigenous group live today more than 50 villages located in six Indigenous Lands (Badjônkore, Chest, Capoto / Jarina, Kayapó, Las Casas and Menkragnoti) totaling an area of about 11 million hectares in south-central Pará and northern Mato Grosso. of an enormous Indigenous territory recognized by the Brazilian Government. Now they feel responsible for the conservation of a large area of forests and savannas, which directly contributes to the conservation of biodiversity, as well as to maintain the rainfall and climate around the globe. So there’s the reason they are named the guardians of Amazon. The Kayapó devote much of our time and energy to the organization and execution of rituals, preceded by hunting or fishing expeditions. Body painting is part of the village everyday life, this activity performed by women since when they become mothers and is a very striking feature of their culture. Only 8 anglers per week will fish this magnificent area of more than 100kms of cristal clear waters. 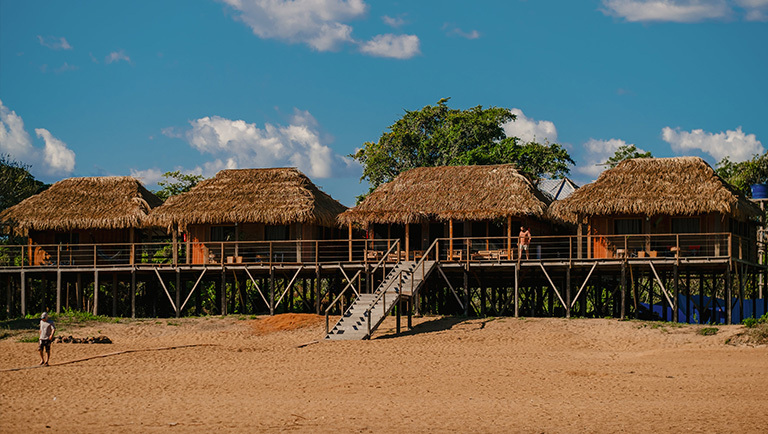 During the 4 weeks of exploratory trips in 2015 and in our inaugural season of 2016, it allowed us at Untamed Angling to truly experience of the potential of the Kendjam fishery that helped Untamed Angling and Kendjam – Kayapó nation in develop the new lodge for this amazing and unique destination. The Kendjam Lodge accommodations are a comfortable Serengeti Style Safari tent camp with 4 double occupancy tents with spring box beds, private bathroom, hot water and electric light. The camp is located in a wonderful Sandy beach area in front of a gorgeous pool of Iriri river, 45kms downstream the Kendjam community. Every evening our guests will be delighted by wonderful cuisine in a well-fashioned living and dining room. Bottled water, soft drinks and juices will complete beverage list on camp. Satellite Internet wireless connection and phone service are provided for all our guests. tent. We provide laundry service at the camp at no additional cost. Just leave your clothes in a designated container, and they will be returned washed and clean, usually within a day. 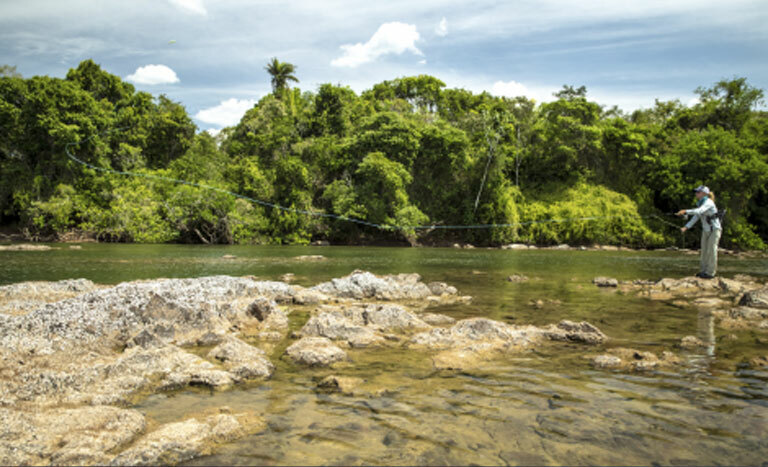 For the most adventurous anglers we provide a two-night out camp location to reach the far and most wild areas of Iriri. The Kayapo Indigenous reserve, which is among the largest protected expanses of tropical rain forest in the world, is controlled by the indigenous people, most of whom can’t read or write and who still follow a largely subsistence way of life in 44 villages linked only by rivers and all-but-invisible trails. One of the most isolated comunity inside the Kayapo land is Kendjam, which means “standing stone” and which took its name from a dark gray mountain, arcing some 800 feet above the green canopy like a breaching whale. provide on of the most intense amazon experiences for the adventure souls. The extremely high level of protection of a enormous portion of Amazon Jungle creates the perfect habitat for mammals, birds, reptiles, insects, and a incredible flora biodiversity. 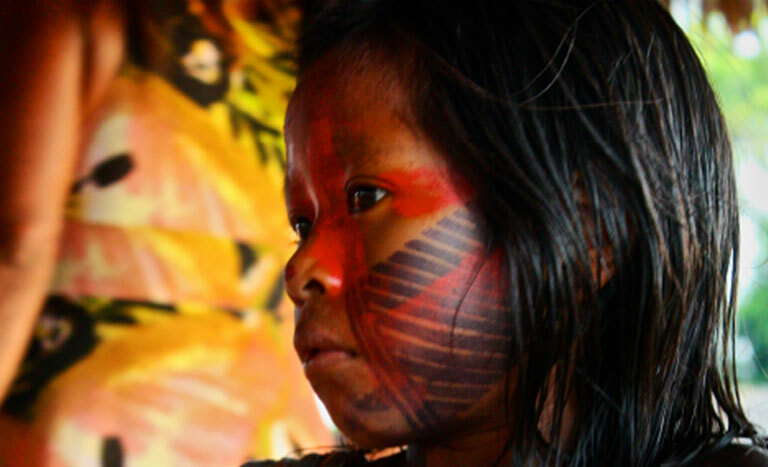 The Kayapo land is truly one of the most prolific rainforest environments of the planet. 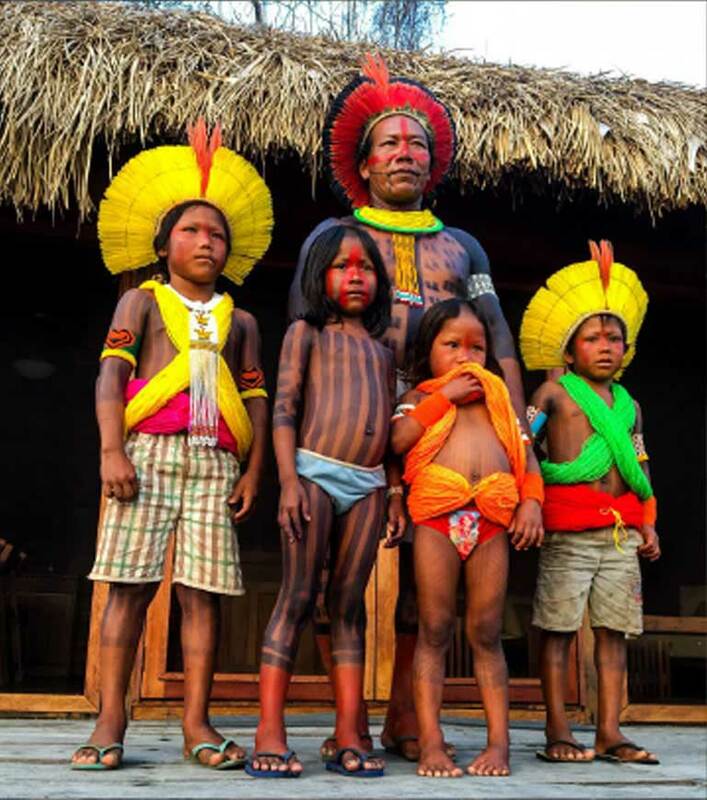 The mammals are a unique attraction in Kayapo Land. These top of the chain animals live in harmony and is not rare to get unexpected encounters with Tapirs, Wild Hogs, Peccaries, Capybaras, and also Ocelots and Jaguars! The giant trees are unique. The most emblematic jungle tree in Kendjam is the Brazilian Nut Tree or Castanheira. This is one of the most important sources of food for the Kayapos, ever. some kilometers, the channels join back together again creating the main river course. This situation is very common in many stretches of Iriri River and sets the stage for this awesome and unique fishing ground in the Amazon. Anglers can target various species using different angling techniques all in same run and pools. Imagine yourself in a clear water jungle river with many different options fornumbers of amazing and powerful Amazon species (many of them unknown to most anglers from around the globe). These are the real runners of Iriri river. Their bodies and turbo boosted tails resembles a barracuda. They are a really aggressive topwater predator and the most exciting way to catch them is using topwater flies like poppers and pole dancers. The bicudas in Kendjam average size 4-10 pounds are the guarantee of pure adrenalin in your fishing day. They prefer to chase their prey in slower runs, flats and pools. This endemic specie of peacock bass is only found in Xingu and Iriri River Basin. Their average size is around 4 to 9pound with some big fish up to 15lbs. They are the only specie of peacock bass that prefer the moving water more than the dead water. We can catch many per day. Most of the time we sight fish for them using streamers and poppers, with a 6 or 7wt rod. The wolf fish if the biggest of Hoplias family, and endemic of Amazon Basin. At Kendjam - Iriri river, anglers will experience sight casting for 10-25 pounds Trairao in shallow water and tributaries. They act like hungry wolves chasing a piece of meat when you cast a popper or a big fly, jumping and fighting hard. We recommend a 8wt rod and floating line for them. We fly fish for 3 different species of Pacu in Kendjam. The Pacu Curupete, Pacu Seringa and Silver Pacu. These mighty Pacu eat insects and anglers can fish them with dries and wet flies with trout sight fishing technics in runs, flats and pools. They are a Jungle delight for trout anglers with a 4 or 5wt rod. The Curupete Pacu (3-12lbs) is the perfect target, which also insects imitations and algae flies in fast waters of the rapids. And they jump! The Payara or Vampire Fish is a real challenge in Kendjam. We can see them rolling in schools in the early morning in pools or chasing baitfish in runs and flats areas. These fish fight really hard and jump a lot. It’s normal to loose some in their jump due to their hard mouth. 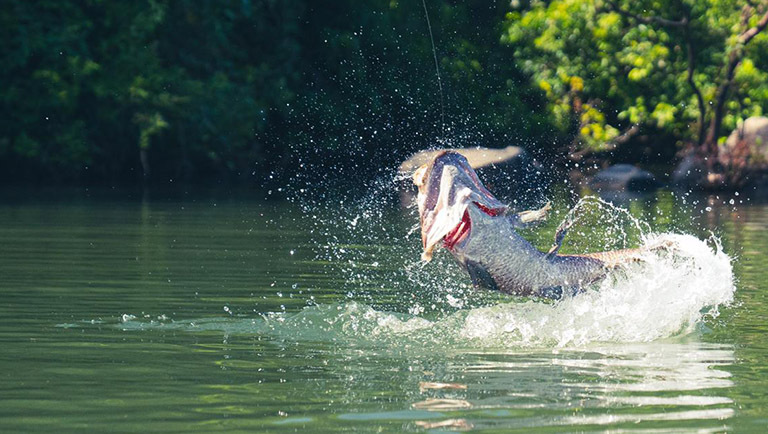 We use streamers and intermediate and sinking tip lines for the Payara and their average size are 5-20pounds. The Matrincha is pound by pound one of the strongest fish in Kendjam. Their average size (2-8lbs) is perfect for 5wt rods with dry flies like hoppers, beetles and topwater attractors. They run and jump like crazy. Be prepared to get your backing off. A 7wt rod is the perfect outfit for them. KEEP UPDATED OF OUR NEWS! Every week we share with you how the fishing is going on. 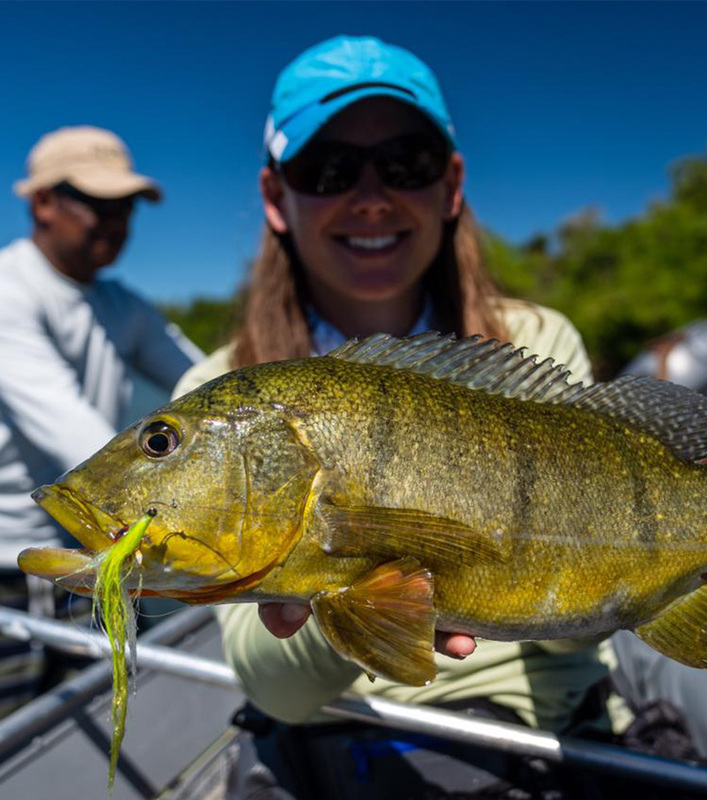 "Kendjam ranks as one of the most diverse and exotic of all fresh water fly fishing experiences one could imagine. One of the true highlights of this fishing is that anglers from all backgrounds have the skills that will provide success. It is probably the most wild fishing any trout angler could apply their skills toward. On top of that, Kendjam is every bit as much of a cultural and ecological experience as it is a fishing experience." "The numbers of fish species in the Iriri River was beyond my imagination and the scenery on the river itself was no less than stunning. Wading and casting big dry flies with a 6-weight fly rod in the Amazon. Are you kidding me? Kendjam can’t be beat!". "UA has done an outstanding job pioneering the way beyond the borders of civilization enabling fly fishermen to fish where none have been before. Kendjam caters to those that want to head deep into the jungles to pursue a vast variety of species in crystal clear water. A sight caster’s delight, Kendjam is a perfect venue for the freshwater trout fisherman and the saltwater anglers, who loves the thrill of a hard hit." "Absolutely some of the best wade fly fishing in the world for fish species and angler can only dream about. The pacu borracha offered some of the finest dry fly fishing I’ve ever experienced – hands down! ".